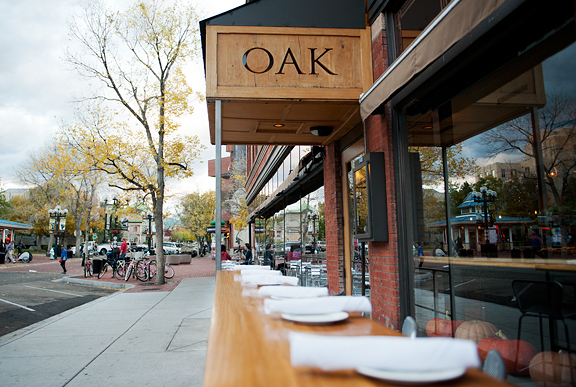 Oak sits on the corner of Pearl and Fourteenth Streets in downtown Boulder. It’s been there for a while and I remember having lunch at Oak a few years ago with a friend, but nothing more than that. 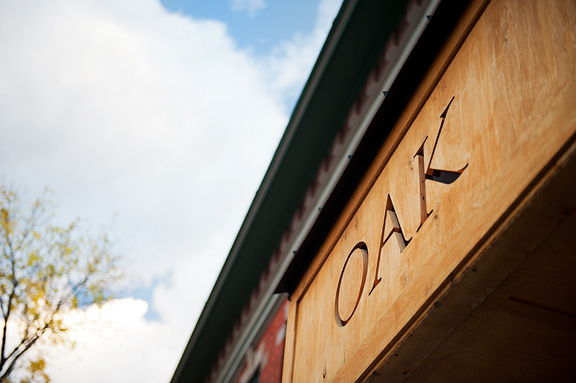 There was a destructive fire, Oak re-opened, and I began hearing great things about their food. It’s got a clean, contemporary, open interior with a main dining room and a smaller adjacent dining room. From the main dining room, you have a view into the open kitchen, the extensive bar, or out the picture windows onto Pearl Street’s shenanigans. Over the course of a couple of visits, we sampled a few of the appetizers or small plates Oak had on offer. 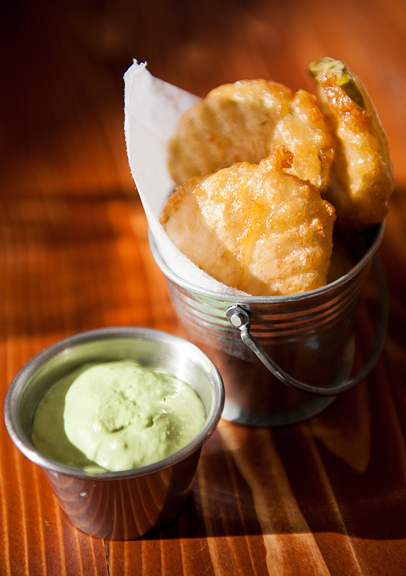 Let me confess, we have ordered the fried pickles every time, because they are THAT GOOD. The pickle slices are crisp and dilly and thick and big, coated in a crunchy, hot batter. It is my favorite item on the menu and that is saying a lot because the food at Oak is pretty much outstanding. 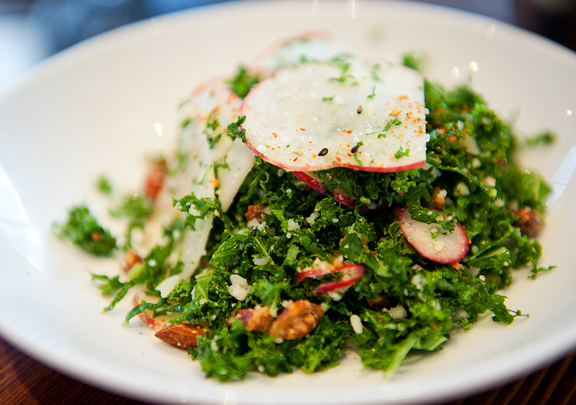 Something so simple as a shaved kale salad was prepared to perfection. 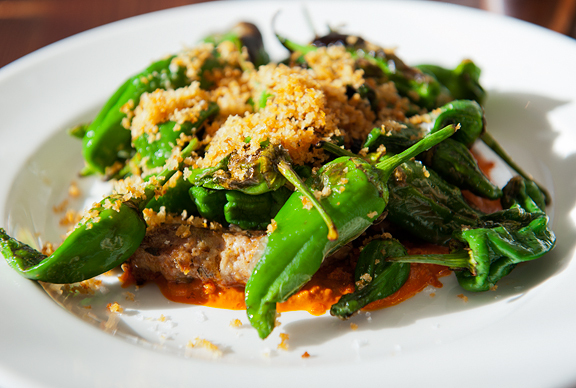 The padron peppers were lightly charred and served on a bed of aromatic sausage and delightful harissa. The menu has an impressive variety without being overwhelmingly ridiculous or underwhelmingly bland like most chain restaurants. It was tough choosing among the entrées. As our first time dining at Oak was a late lunch, we both had sandwiches on the brain. My shrimp po’ boy arrived looking like a brightly colored confetti sandwich. The shrimp were tender, juicy, and sweet (i.e. fresh) coated in a crunchy cornmeal-based batter. There was spice, crunch, tang, heat, and creamy smoothness in each bite. Also, they use some sort of buttery, velvety bun that melts in your mouth. Heaven in each bite. Jeremy’s burger was dripping with beefy goodness. 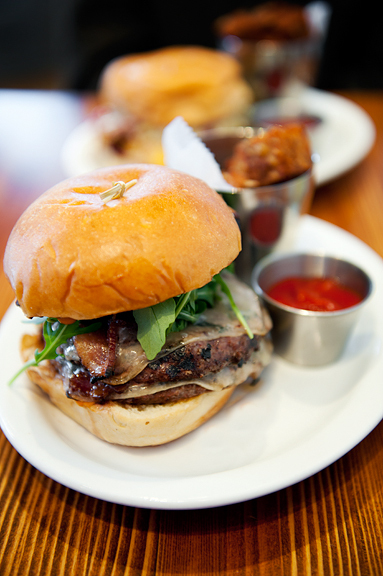 It had that distinct smoky flavor off the grill paired with salty bacon, melted gruyère, peppy harissa, and arugula all on that buttery bun. I was becoming a little obsessed. Our second visit was timed with dinner. While Jeremy went the sandwich route again, I tried the pasta. Actually, I don’t know that Jeremy knew it was a sandwich, as it was listed as chicken fried steak. Whether it is plated as chicken fried steak or stuffed into a sandwich, you are in good hands at Oak and I’m certain it’s going to be good either way. Their tater tots are a mouth-treat: cubes of fluffy, soft potato, deep fried and lightly seasoned – they are as fun as they are delectable. 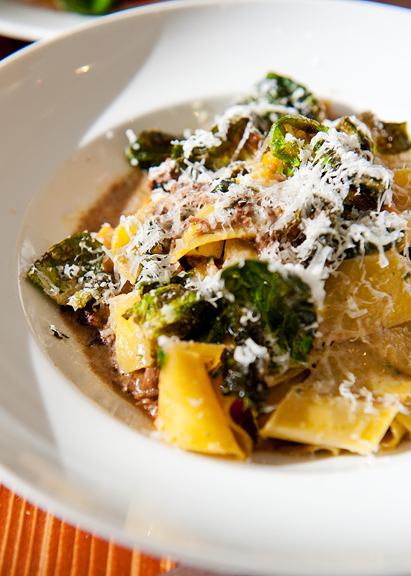 As for my pappardelle, I was torn between two or three dishes and my server recommended this one. I’m so glad he did, because the pasta was cooked perfectly al dente and it arrived swimming in the heady broth of the braised short ribs. The dish was dotted with diced root vegetables roasted to an earthy sweetness, fried brussels sprouts leaves, and shreds of delicate short rib meat. It was magical. So much so that when Jeremy and I traded plates halfway through our meal, I took a bite of his sandwich (it was good) and then asked for my plate back. We shared a root beer float for dessert the first time – we were just too full of savory goodness the second time to get dessert. 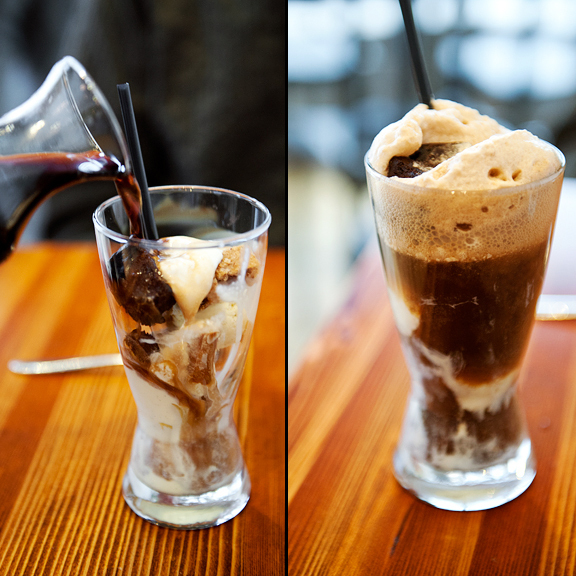 Ordering the root beer float means that I have unwittingly (yet happily) sampled all three of Oak’s housemade sodas, and they are wonderful. But if you pour the root beer over vanilla ice cream with chocolate chip cookie and brownie and pretzels, that’s something else entirely. That’s something amazeballs. I have yet to find anything at Oak that I don’t like. More likely than not, theirs is the kind of fare I tend to love. 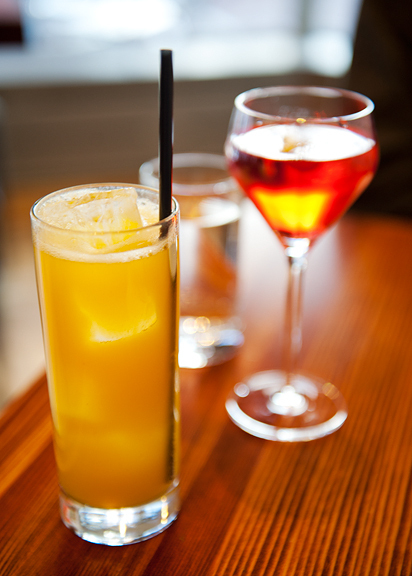 It’s a casual atmosphere that brings creativity to you in a glass or on a plate. I like the eclectic mix of flavor accents from other cultures or a funky twist on a classic recipe. 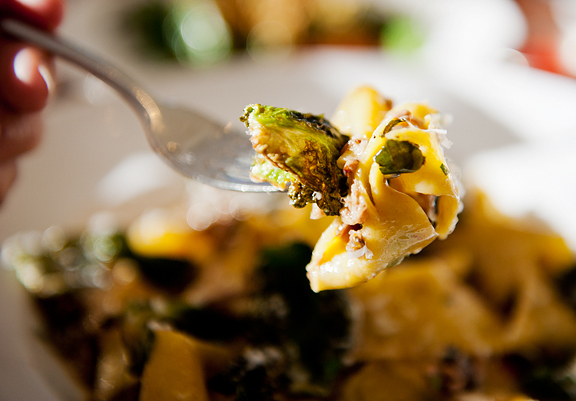 The food arrives hot, the service is polite, prompt, and friendly. I think Oak is filling the hole in my heart that The Pinyon left when they closed. It is fast becoming a favorite of ours. 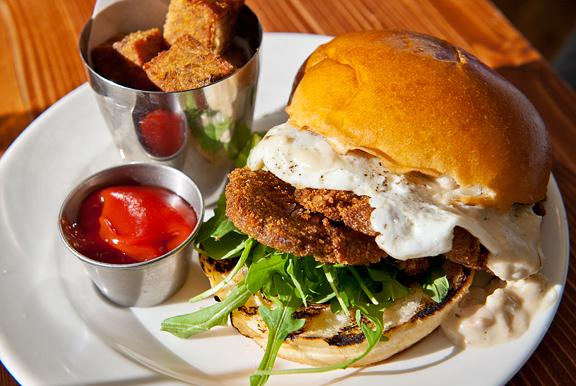 Oak is open for lunch (Monday-Saturday 11:30a to 2:30p), midday (Monday-Sunday 2:30p to 5:30p), dinner (Monday-Sunday 5:30p to 10:00p), and late night (Thursday-Saturday 10:00p to 12:00a). Oak at Fourteenth is on Facebook. Full Disclosure: No comps for the chomps – totally 100% my opinionated opinion. One time we met family members in Boulder and they suggested The Cheesecake Factory. That was a sad day. At least they paid for it. I remember walking past this place not long after the fire, but other than that, it was not on my radar. Until now. Thanks as always for letting us know about good food! Right now I want that kale salad, but it all looks great. MMMM looks amazing! I’ve been wanting to go there! Shrimp, champagne and mango…..sounds good!!!!! Jen, just curious as to which camera you used taking these shots? I’m looking at getting something smaller then my Canon 5dII to carry around. Thought you might be using something smaller then a DSLR? Thanks. I am in total agreement with you. We were just discussing this last night after having a perfectly awful meal at a Mexican restaurant that we were sorry we shelled out the pesos for. And as for Oak-I think we ordered the same things. 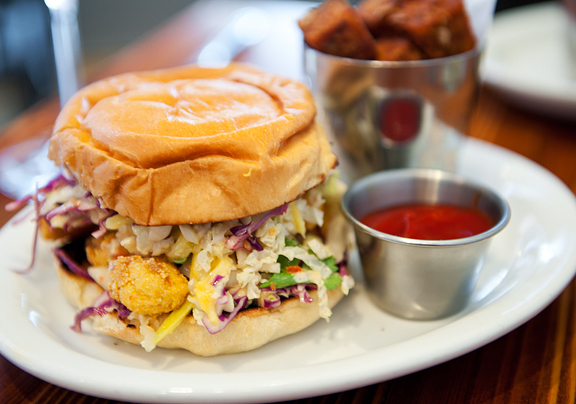 The kale salad is delicious, the pickles, the poboy… wish we lived in Boulder! What did you think of the tater tots? I didn’t like them. I looooved the kale salad though! Adrienne – I really like them (I’ve been back a few times since). Francesca – I’m meh on the tater tots. They were okay, but everything else was pretty amazing. Thanks for the great post. I need to try the Shrimp Po Boy. They just added a ramen dish. Have you tried it?